As one of the leading suppliers of suspended ceilings, Saint-Gobain Ecophon provides acoustic solutions to create better working environments across a variety of industry sectors. 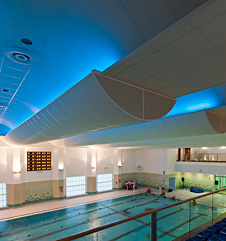 Ecophon’s range of ceiling tiles, rafts, wall panels and baffles help to reduce excessive reverberation and optimise sound quality. Ecophon provides a whole range of specialist services from acoustic calculations, technical support, design and integration details to liaising directly with project architects to provide advice on the most appropriate acoustic and aesthetic solution. Working closely with all parties involved including architects, main contractors and ceiling installers, enables Ecophon to fully understand the specific requirements of a particular project, and identify any possible challenges or design issues which need to be considered. Acoustics are integral to the way we experience buildings, whether we are moving through public spaces such as theatres, restaurants or shops; being cared for in hospitals; performing precision manufacturing within clean room conditions; working within open plan office environments; or studying in classrooms. Each environment places specific demands on the fabric of the building, its design and maintenance considerations. 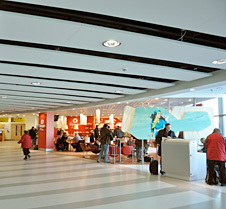 For example; Hygiene Meditec ceiling tiles are designed to provide high sound absorption specifically for healthcare requirements; Master Rigid ceiling panels have been designed to be ‘kid proof’ in tough school environments; and the Master Solo ceiling panels provide sweeping artistic license from the most contemporary of modern airports to the more modest spaces within offices. To help create a better sound environment, whether in schools, hospitals, offices or any indoor environment which requires good acoustics, Ecophon applies a technique called Room Acoustic Comfort™ to evaluate different room types and the activities that take place within them, to create the perfect acoustic balance using its range of suspended ceilings, floating rafts, free hanging units, baffles and wall panels.